Sea of Life tapestry shows a marine version of the beautiful tree of life. Here we see a coral tree on the ocean floor with branches, decorated by the beauty of the sea, including jelly fish, cockles, sea urchins, and starfish. Even the sea floor is beautifully decorated, as is the background with calligraphy, and sea ferns. The border is seen as sea foam with sea motifs all around. 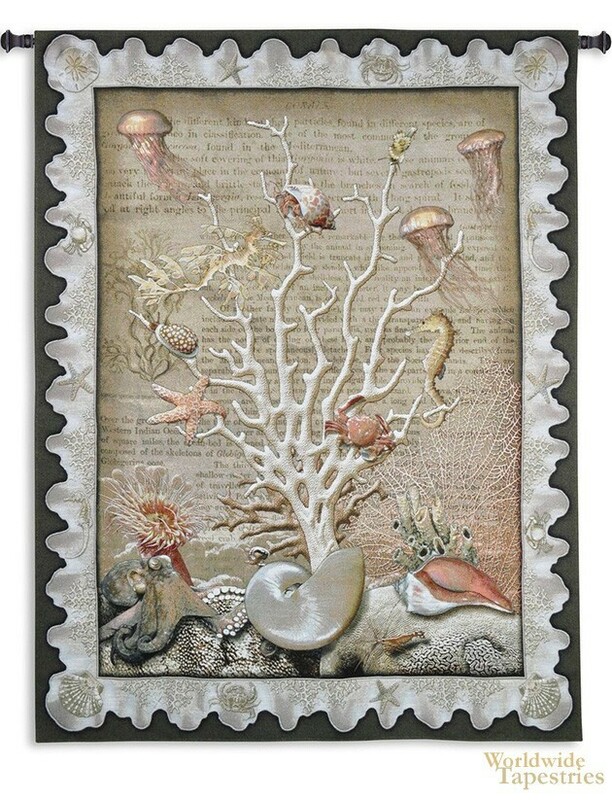 This fish tapestry and sea themed tree of life is a beautiful celebration of life. This Sea of Life tapestry is backed with lining and tunnel for easy hanging. Note: tapestry rod and tassels, where pictured, are purchased separately. Dimensions: W 52" x H 67"